I love this recipe because it brings a whole new flavor to broccoli, and it’s also a hit with my toddler – he can’t get enough! If you’re not a big fan of broccoli, this recipe could easily convert you! Did you know that roasting broccoli will bring out a sweeter, caramelized flavor? That flavor compliments many types of meat and seafood. Also, it’s good for you! 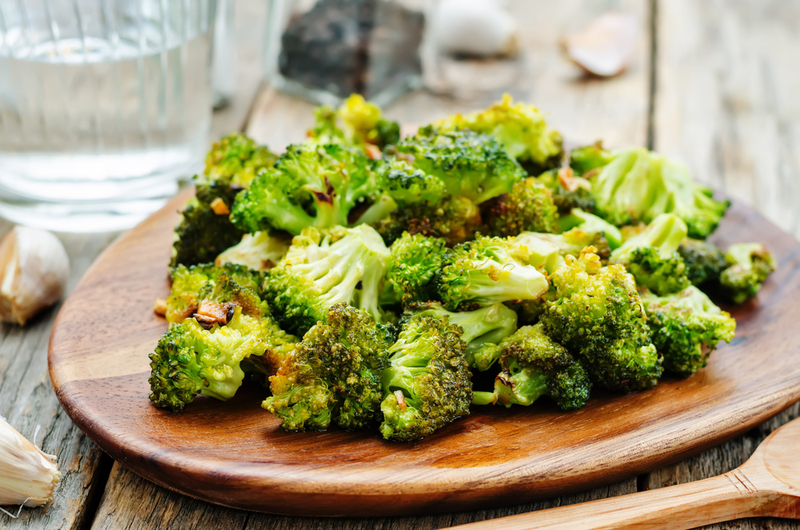 One cup of broccoli is a good source of Vitamin A and B6 and an excellent source of Vitamin C.
Toss broccoli florets in olive oil. Place broccoli on a baking sheet, and spread out into one layer. Roast at 475F for 10 minutes. After 10 minutes, remove baking sheet from oven, and stir, turning broccoli over. Redistribute broccoli in a single layer. Return pan to oven and roast another 5-10 minutes, until broccoli begins to brown slightly on edges. Remove from oven, sprinkle with salt and pepper if desired, and serve.